delighted audiences at both our 15th Annual Benefit Weekend in 2000, and our 18th Annual Benefit Weekend in 2003. He also did not disappoint fans who gathered at the home of Bruce Cohen, in Silver Spring, for our very first WFMA House Concert in 2012. We are delighted to have him back for another concert on June 16. Avoiding the compromises of the commercial music industry during his 50+ year professional career, Jack prefers touring under the radar, playing concerts, large and small, week in and week out, from the sheer love of music and performing. Playing for more than 50 house concerts each year, Jack enjoys the intimacy of that venue most of all, with a more personal connection to his listeners. From acclaimed appearances at the Newport, Boston, Philadelphia, Kerrville and New Bedford SummerFest Folk Festivals, his musicianship, songs, stories and commanding presence have established him as an uncommonly inspiring and influential performer. Tickets are no longer available online and will not be available at the door. '); // document.write("Don't wait any longer to order your tickets for this show. There are fewer than 40 left! It is unlikely that more tickets will become available, but if you would like to be placed on a waiting list, '); // document.write('please send an email to reserve@wfma.net with your name, the number of tickets you need and that you wish to be placed on the Dave Rowe waiting list. '); // document.write('If/when we can accomodate your request, you will be notified via email. '); // document.write(' After the deadline, tickets - if available - can be purchased at the door, beginning at 5:30 PM on June 16. '); document.write("
, in the heart of downtown Bethesda, MD, has been owned and operated by the Traettino family since 1977. 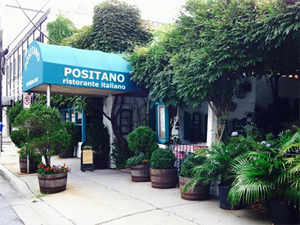 Positano is a outstanding, full-service Italian restaurant serving lunch and dinner seven days a week.